Do you ever just take a second to fully devour the moment? To take a deep breath and truly feel what all your senses are trying to tell you. To take a minute to feel all the emotions coming up for you. To allow your toes to fully sink into the ground and feel the wind brushing against your hair as the birds sing their daily song. I’m realizing we don’t take enough moments to fully be there. Be present in what is happening. 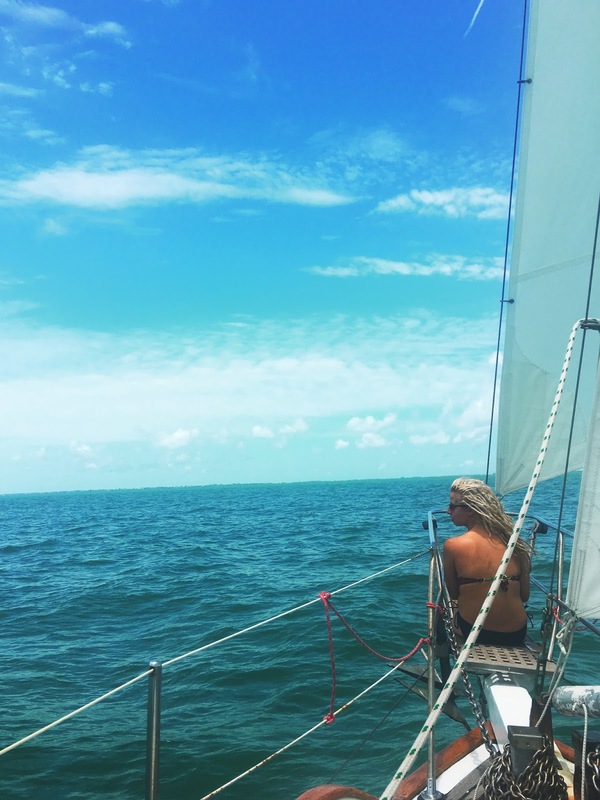 This past weekend I actually went on a sailboat ride. Something I have dreamt about for years and always wanted to do. A few of my girlfriends and I rented a sailboat with a captain for a day of sailing. When we first set off into the open water I felt a wave of excitement come over me. Incredible music playing, the sunshine beating down upon us and I was surrounded by glorious women with excitement in their eyes. When the time came for us to all leap in the water, we were desperate for it. 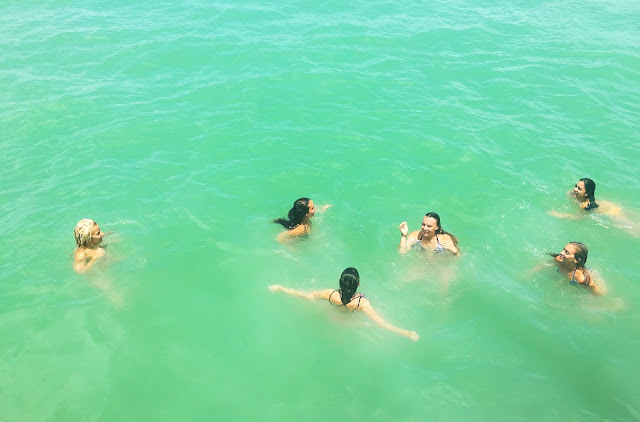 With the seasickness and the heat, a jump into the cool gulf would be the most refreshing experience. We held hands, looked down and looked at each other. Excitement and nervousness all crept up upon us. So I counted to help with the anticipation to leap. The dive in was more refreshing than I could have ever excepted. The water cooling me down and releasing the motion sickness from my body. We swam, we giggled, and we let the water wash over us. I let my body float in the water. Arms spread wide to feel the salt water cooling the tops of my shoulder blades. I could hear and feel the ocean, with the wave’s moments and my body letting go to be held by the Gulf. 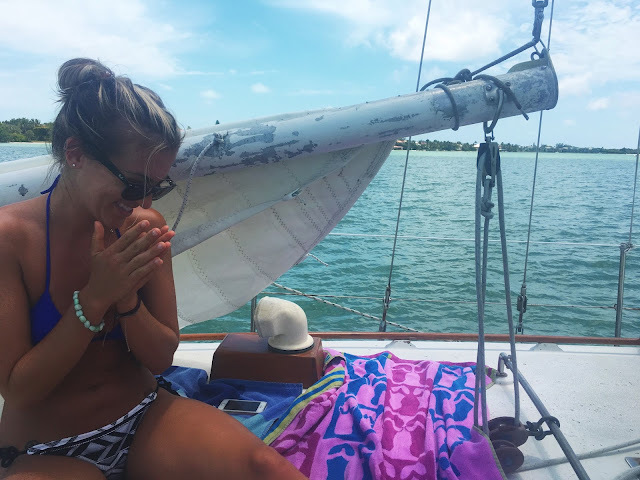 I heard the laughter of all my girlfriends on the sailboat, just in complete glee of the day we were having. And I could feel the sun trying to grasp its way into my eyelids as I shut them tighter. I wanted to take this moment in. Remember it fully for all it had to offer. With the excitement we had all felt the entire day and the happiness I was feeling as the water carried me. Moments like this where we can truly appreciate life. I have a tendency to get overly excited. To points where I just can’t believe something is happening and become overwhelmed. During these moments I try to take it in. Be in the present moment to feel. And during any moment where you feel disconnected from where you are. When you are worrying about tomorrow, or focusing on the pain of yesterday.